The whisky bottler and retailer Cadenheads celebrates its 175th anniversary this year - and its Edinburgh shop offers all the tradition, range and expertise the most discriminating connoisseur could ask for, says Tom Morton. ABERDEEN’S Netherkirkgate is a strange clutter these days, of concrete, cobbles and yellow lines, new construction and hints of something ancient, something made of the city’s eternal granite. It’s a corkscrewing backwater behind nearby Union Street, and boasts an entrance to a vast basement pub called The Illicit Still. Which is slightly ironic as 175 years ago, and until 45 years ago, 47 Netherkirkgate was the headquarters of William Cadenhead, the extremely legal bottler and purveyor of whisky and other spirits. These days, the Cadenhead retail operation in Scotland continues to thrive in Edinburgh, at 172 Canongate, where its legendary whisky shop offers its Campbelltown-based parent company’s unique bottlings, along with a worldwide variety of whiskies and other spirits, all coupled with formal and informal tastings and the level of staff expertise you would expect from one of the most prestigious names in uisge beatha. 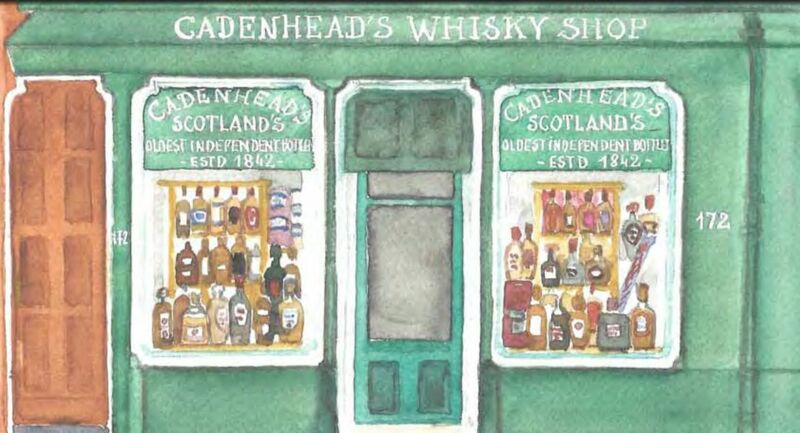 Cadenheads is the oldest and one of the most admired independent bottlers in Scotland.